I know it's a really long time since I last posted anything... I have soo many photos, news, things that I want to share that have been back lagging for me. I blame house move, no internet, holidays, Milan Design week and last but not the least Volcanic ashclouds for all of it. I think instead of starting from where I last left off I think I'll talk about what been happening lately and then work my way back including some amazing posts on Milan's Design Festival Salone De Mobile. So the latest news is that my friend and the very talented Nat Nicklin and I are taking part in We Make London's Summer Fair. And here's a sneak peak at one of my new lines that I will be showcasing there. The Alphabet plates. 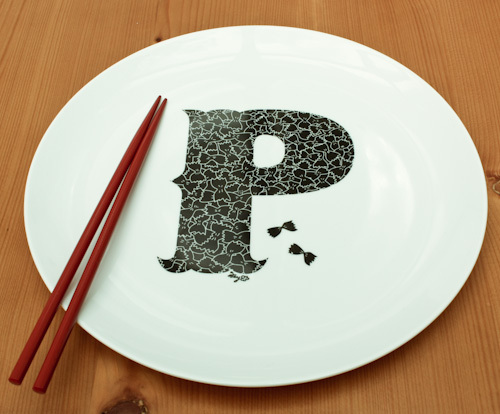 Inspired by food, each alphabet is hand illustrated with food starting with that alphabet. 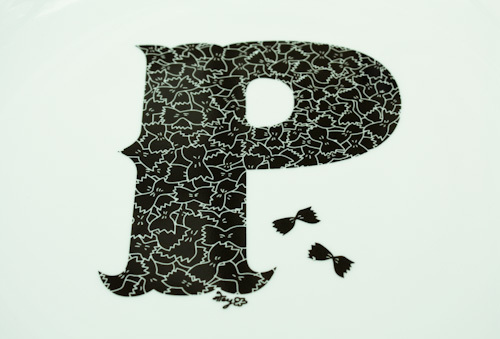 I started with P of course but in the next few weeks will share with you all the designs. So hope to see you all on June 26th at The Chelsea Town Hall!